The schedule for January – March 2019 has just been released! We run Fun Adult Starter Tennis (FAST) program which introduces the basic fundamentals of play as well as rules and scoring, to get the players to serve, rally and score. We use a new system of learning through progressions so tennis is easier and not as frustrating to learn. 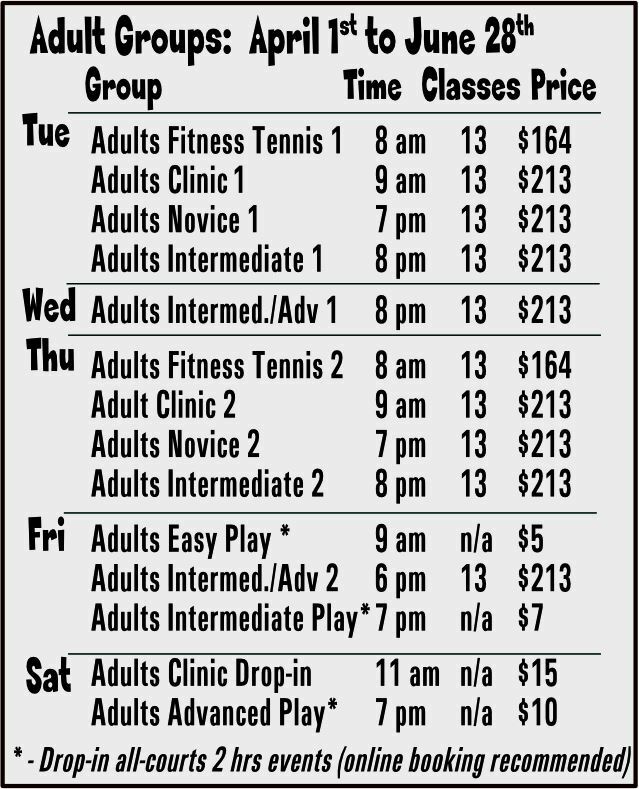 Please see below the schedule of Learn and Play sessions, clinics and Match Play for adults. The group number does not mean a level or a prerequisite. You can take group 01 and/or 02 on your level of play! Get your 10,000 steps in and your heart pumping while you work on your tennis skills! Adults Clinic Group 01: Tue 9:00 AM for 1 hour. $213/13 sessions. Adults Clinic Group 02: Thu 9:00 AM for 1 hour. $213/13 sessions. Novice to Intermediate levels will work on basic tennis skills. This clinic runs in a small group so everyone gets lots of coach’s attention! Drop-in Clinic Group: Sat 11:00 AM for 1 hour. $15/session. At this level, you are fairly consistent when hitting medium-paced shots, but not comfortable with all strokes and lacking execution when trying for directional control, depth or power. The focus will be on improving court coverage on groundstrokes and getting more comfortable with net play. Fundamentals to using spin on groundstrokes and serve. Singles and doubles game tactics. At this level, you are a strong intermediate to advanced player. You are playing aggressive groundstrokes and are comfortable with volleys and net play. You use spin on groundstrokes and serve. Your first serve is powerful with some directional control. You are using high percentage tactics to be more competitive. Tennis hard-hitting string-breaking sessions rotate players for 120 minutes of Tennis. Men and Ladies mixed together. Expect NTRP level 4.0 and above. See the full schedule below and please click here to register! As usual, if you have 4 or more participants we can create a new group and put is in our permanent schedule. 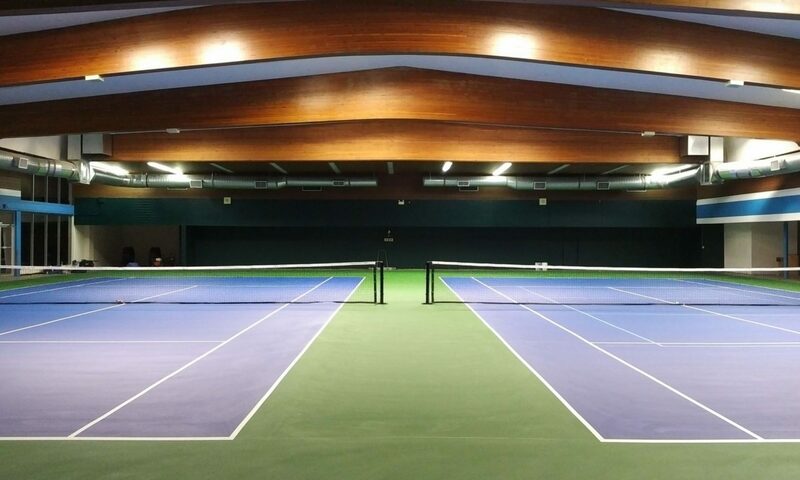 Please contact us at https://prtennis.ca/contact-us to arrange for a new group. For this term we decided to extend sibling discounts (20%) to the family couples! The rebate applies to your account when two spots are registered under the same account. Please note that due to holidays we have different number of lessons for different programs which is reflected in the cost of the blocks of lessons. Please see below definitions for each of the levels and as we will be tailoring the programs to these. A more detailed rating guide is available here. 1.5 – Has limited experience and is still working primarily on getting the ball into play. 2.0 – Lacks on-court experience. Has obvious stroke weaknesses but is familiar with basic positions for singles and doubles play. 2.5 – Learning to judge where the ball is going although court coverage is weak. Can sustain a short rally of slow pace with other players of the same ability. 3.0 – Fairly consistent when hitting medium-paced shots, but is not comfortable with all strokes and lacks execution when trying for directional control, depth or power. Most common doubles formation is one-up and one-back. 3.5 – Has achieved improved stroke dependability with directional control on moderate shots, but still lacks depth and variety. Starting to exhibit more aggressive net play, has improved court coverage and is developing teamwork in doubles. 4.0 – Has dependable strokes, including directional control and depth on both forehand and backhand sides on moderate shots, plus the ability to use lobs, overheads, approach shots and volleys with some success. Occasionally forces errors when serving and teamwork in doubles is evident. Rallies may be lost due to impatience. 4.5 – Developed the use of power and spins and beginning to handle pace, has sound footwork, can control depth of shots and is beginning to vary game plan according to opponents. Can hit first serves with power and accuracy and place the second serve. Tends to over hit on difficult shots. Aggressive net play is common in doubles. 5.0 – Has good shot anticipation and frequently has an outstanding shot or exceptional consistency around which a game may be structured. Can regularly hit winners or force errors off of short balls and can put away volleys, can successfully execute lobs, drop shots, half volleys and overhead smashes and has good depth and spin on most second serves. 5.5 – Has developed power and/or consistency as a major weapon. Can vary strategies and styles of play in a competitive situation and hit dependable shots in a stress situation. 6.0 – Has obtained a sectional and/or national ranking. 6.5 – Has extensive satellite tournament experience.